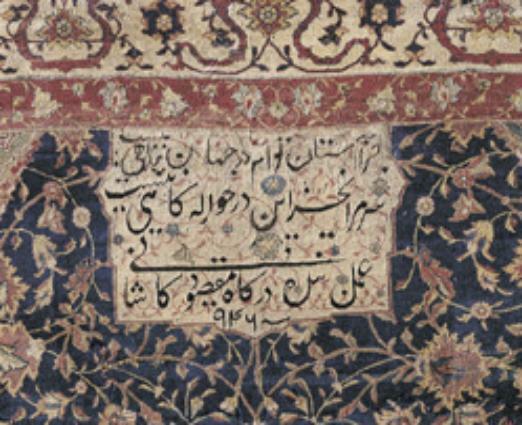 Both Ardabil carpets carry the same inscription: "a couplet from a ghazal by poet Hafiz" followed by the signature of its master weaver Maqsoud Kachani and it's dated 946/ 1539-40 after Christ. It is positioned between two triangles towards one of the vertical borders. "I have no refuge in the world other than thy threshold. There is no protection for my head other than this door. The work of the servant of the court Maqsud of Kashan in the year 946." The epigraph is a double illusion destined to showcase in one part the master weavers recognition towards his protector who ordered the creation of the rug (likely Chah Tahmasp at the beginning of his reign) and expressing in second part, the devotion of the weaver towards Chah Tahmasp and god his protector.